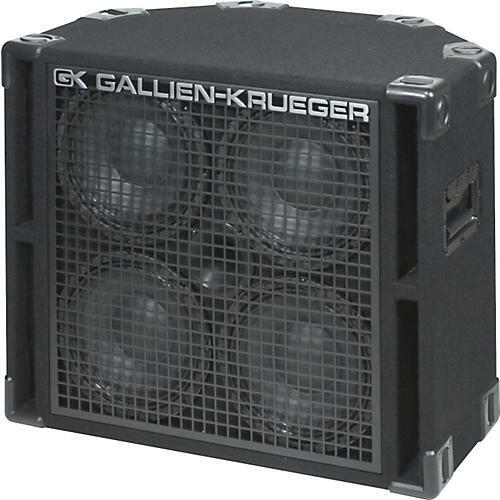 The Gallien-Krueger 410RBH 800W 4x10 Bass Cab with Horn is a perfect cab to pair with the 400RB head. 8 ohm operation. 800W handling. 4 cast-frame 10" speakers plus horn. Switchable between biamp, full range with built-in horn power limiter for protection. The 410RBH cab is made of birch with black carpet covering, a 16-gauge steel grille, interlocking corners, nickel-plated casters, and dual front-loaded ports. 27-1/2"W x 23"H x 18"D. 92 lb. 1-year warranty on speakers. 2-year warranty on electronics.